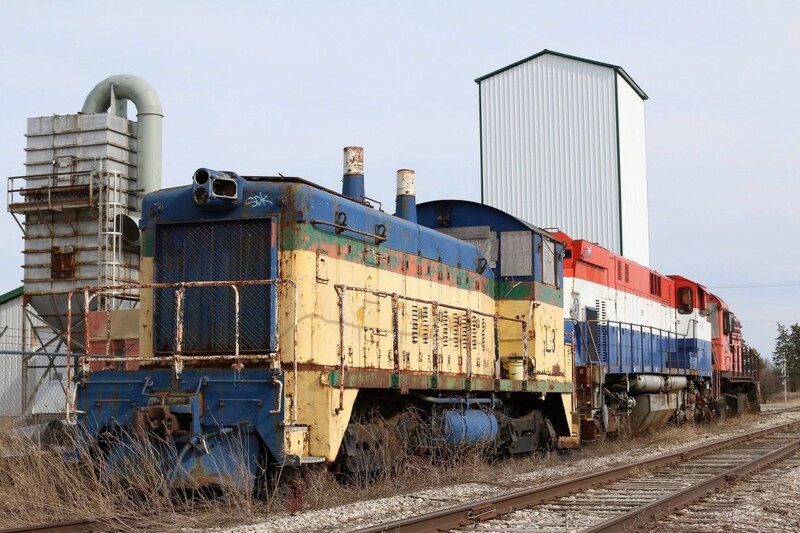 Railpictures.ca - Marcus W Stevens Photo: Relics at Mount Elgin. There is a lot of history packed into the week choked siding at Mt. Elgin. A trio of old retired locomotives now serving as little more then a parts source slowly rust away in the elements. SW9 #L3 better known as OSRX #52 began life back in 1951 as C&O 5242. It later went to the L&PS before coming to the OSR. Trailing M420 646 started out on the British Columbia Railway in 1973, spending its entire active life there before coming to the OSR. RS23 506 sits well picked over on the other end. It last worked for Tembec as #179. It should have been numbered OSRX 507 before being delivered but it would seem that as it was only purchased for parts it somehow ended up being numbered as the second 506 on the OSR’s current roster. The Cargil elevator behind sadly closed a few years ago and is no longer an online customer. | Railpictures.ca – Canadian Railway Photography – photographie ferroviaire Canadienne. Caption: Relics at Mount Elgin. There is a lot of history packed into the week choked siding at Mt. Elgin. A trio of old retired locomotives now serving as little more then a parts source slowly rust away in the elements. SW9 #L3 better known as OSRX #52 began life back in 1951 as C&O 5242. It later went to the L&PS before coming to the OSR. Trailing M420 646 started out on the British Columbia Railway in 1973, spending its entire active life there before coming to the OSR. RS23 506 sits well picked over on the other end. It last worked for Tembec as #179. It should have been numbered OSRX 507 before being delivered but it would seem that as it was only purchased for parts it somehow ended up being numbered as the second 506 on the OSR’s current roster. The Cargil elevator behind sadly closed a few years ago and is no longer an online customer. Not sure if Straw Boss still has rail related plans. But at the time they were doing the reno’s it appeared that the track on the inside of the property was extended a little bit. Last i heard was a lot of their straw either came from or went to the west.